This Roasted Chickpea Snack Mix shares the same magical salty-sweet, chewy-crunchy qualities I remember from that day at the zoo. It’s high in protein and fiber and packed with nutritious ingredients, and like the snack mix my aunt so thoughtfully packed for me, it will keep you energized through any adventure. Note: In addition to watching monkeys and tigers, “adventures” can also include staying awake during painfully dull meetings, navigating overcrowded shopping mall parking lots, and/or refraining from hangry-texting your husband that he left shaving cream splattered all over the bathroom mirror and his slippers in dangerous tripping territory again. Hanger-prone, munchie-loving individual that I am, crispy roasted chickpeas have long been one of my favorite healthy snacks. Although I can happily demolish an entire bowl of healthy roasted chickpeas on their own (especially spicy roasted chickpeas like the ones on top of this Caesar Shaved Brussels Sprouts Salad), lately I’ve been loving them as a fresh, unique addition to snack mix. 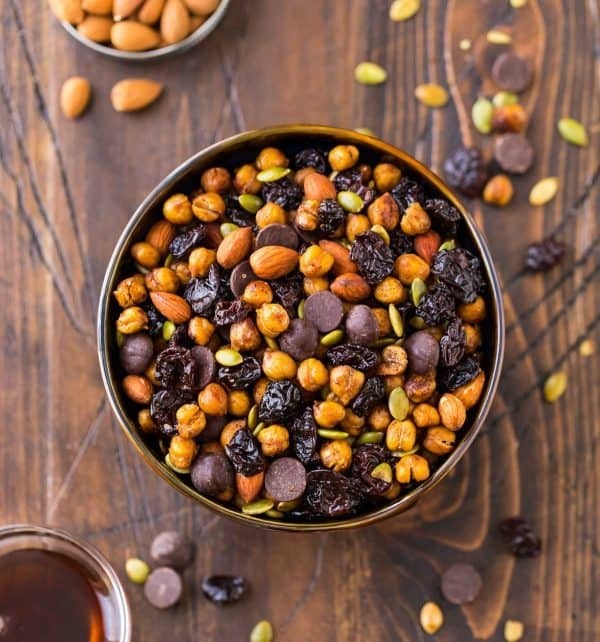 The crispy texture and mild, nutty flavor of roasted chickpeas makes them easy to adapt to a variety of spice blends and other yummy trail mix additions. For today’s snack mix recipe, I opted for sweet roasted chickpeas by tossing them with cinnamon, a touch of maple syrup, and smoked paprika. The cinnamon and maple give the snack mix warmth and make it feel like a treat, while the smoked paprika adds a light, intriguing background note that will keep your hand reaching back into the bowl for more. Chickpeas are a member of the pulse family, which also includes lentils, dried peas, and beans. High in protein and fiber, pulses are an affordable, easy way to up the nutritional profile of almost any recipe. For more info, you can check out the Pulses website and sign up for the Half-Cup Habit, in which participants strive to better their diets by enjoying 1/2 cup of pulses three times a week. With chickpeas as my inspiration, I rounded out the Roasted Chickpea Snack Mix with other superfood ingredients: pepitas and almonds (healthy fats, protein, fiber, and nutrients), dried cherries (antioxidants), and—as you were hoping if we share similar trail mix priorities—chunks of dark chocolate (more antioxidants + best things in life!). 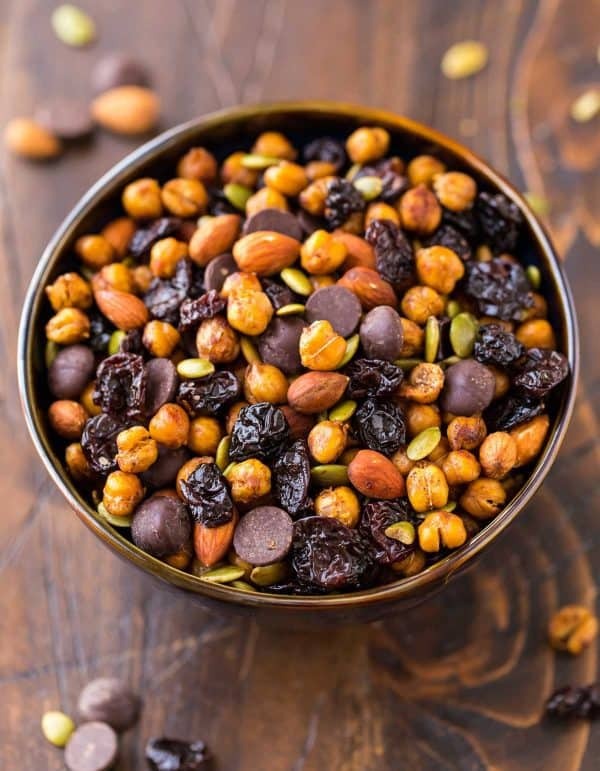 The next time you need a healthy snack (which in my case will be about 15 minutes from now), give this Roasted Chickpea Snack Mix a try. Crispy, crunchy, salty, and sweet, it’s a delicious way to stay energized for any adventure. 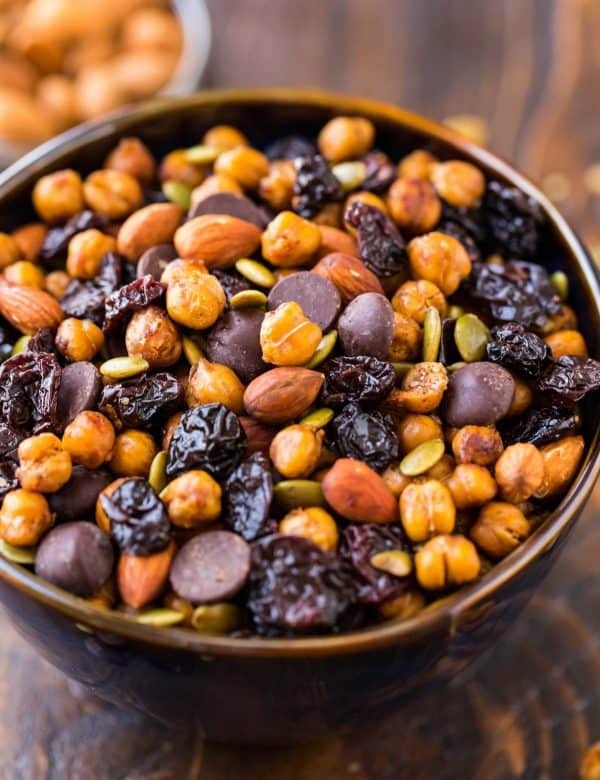 Roasted Chickpea Snack Mix. 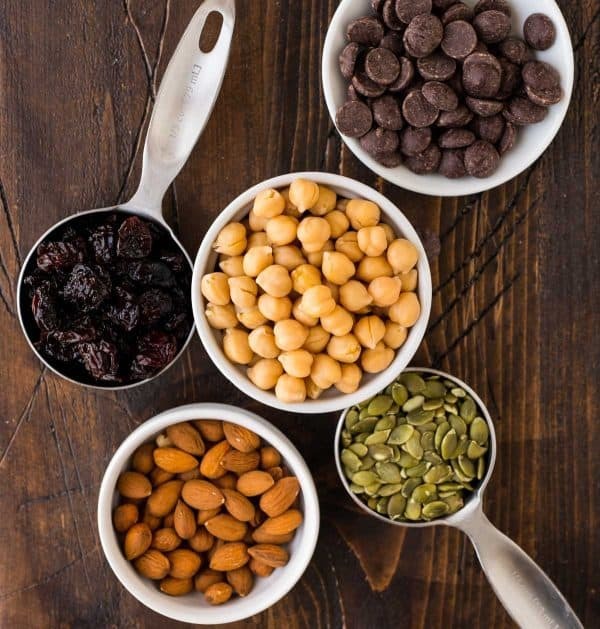 Crunchy cinnamon roasted chickpeas with dried cherries, almonds, pumpkin seeds, and dark chocolate. Easy, healthy, and completely addictive! High protein and packed with super foods, it's the perfect on-the-go healthy snack. Place a rack in the center of your oven and preheat the oven to 375 degrees F. Line a rimmed baking sheet with parchment paper and set aside. Lay the chickpeas on a double layer of paper towels and dry them as much as you can, changing out the towels as needed. Remove any skins that come loose (no need to get them all). 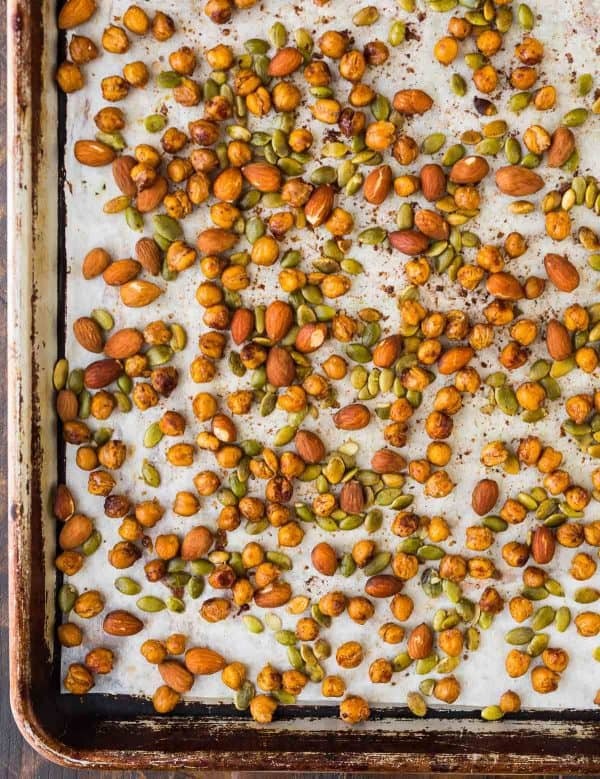 Spread the chickpeas in a single layer on the prepared baking sheet. Bake for 10 minutes. (Do not be tempted to add anything to the chickpeas. Starting them out in the oven plain helps them become extra crispy!). Remove the chickpeas from the oven and drizzle with the coconut oil and maple syrup. Sprinkle with the cinnamon, salt, and smoked paprika. Toss to evenly coat (the pan will be hot—be careful!—let cool a few minutes as needed), then return the chickpeas to the oven for an additional 10 minutes. Remove the pan from the oven once more and give it a little shake to rotate the chickpeas. Add the pepitas and almonds to the pan in a single layer. Continue baking until the nuts are toasty and the chickpeas are brown and crisp, about 8 to 10 additional minutes. Place the pan on a wire rack and let cool completely. Once the chickpeas and nuts are cool, add them to a serving bowl. Stir in the dried cherries and dark chocolate chips. Divide into desired portions and store for later or munch immediately! Store for up to 1 week in an airtight container at room temperature. If you use a ziptop bag, the chickpeas will soften but will still be delicious. If you’d like to keep them extra super crispy, try a parchment paper bag like these or these. I do not recommend freezing this recipe, as the chickpeas and nuts become soft. I just bought a container of dried goji berries and a large container of roasted unsalted nuts. Given they are already roasted, I imagine it will be a tad different than starting with raw, but I think it’ll turn out fabulous. Making this tonight! I hope you love it, Kori! Hi Erin! This looks yummy! I’ve always wanted to roast garbanzo beans! I LOVE trail mix, too, and this one sounds like a winner! Thanks, Laurie! I hope you enjoy it if you give it a try! So many textures and flavors…how could you NOT love it?! Do you put fresh chickpeas or dried chickpeas? If they are dried, should I hydrate them first? Hi Francisco, canned chickpeas are already cooked, so that’s what I used here. If you have dried chickpeas, they should be cooked first before using in this recipe. hey girl- this mix looks really good! Just made this recipe earlier today. The only thing I did differently was to use dried cranberries instead of cherries, since that’s what I had on hand. I also waited to toss the chickpeas in the cinnamon and smoked paprika until the last 10 minutes, when I added the pepitas and almonds. This is delicious, I will definitely be making it again. Thank you! YAY!! So happy you enjoyed it Christina. Thank you for trying the recipe and taking time to leave this wonderful review! OMG, this snack has all of my favs! Thanks for the post. I love extra crispy chickpeas and that paprika absolutely solidifies the mix… thank you for the delicious, simple recipe! Thank you so much, Julia! I’m so glad you enjoyed it! Hi DJ, you could try roasting them a little longer next time. Some softening is normal, but they shouldn’t be overly soft or soggy. I made the recipe, which was tasty, but the chick peas did not get crunchy. I followed directions. Even tried twice. Hi Pam, my three biggest tips for getting crisp chickpeas are in the recipe (drying thoroughly, roasting without seasoning first/baking in a single layer, and letting them cool completely), so if you followed those tips already, it’s difficult to know what else may be causing your chickpeas to stay soft. It may be that they weren’t baked long enough. Next time, you could also try preheating your baking sheet in the oven as it warms up and putting the chickpeas on the hot sheet—I’ve never tried that with chickpeas, but I know it works well in some french fry recipes. I hope that helps!